Synchronous Bottle divide: a more stable transmission for Bottle. Push-button control cabinet: a more humankind operation. 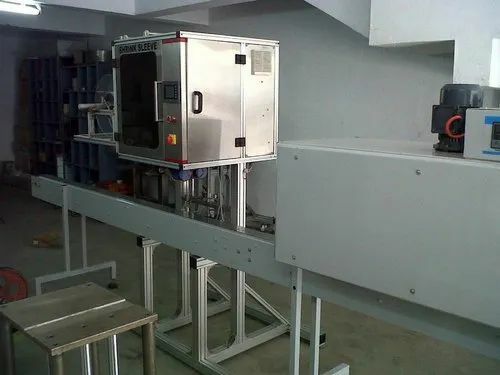 Applicable Varieties for wrapping Label: With a breakthrough of the traditional technology of casting label, the equipment can integrate three to four trapping label machine varieties into one. It only needs to change the modules to realize the casting label of different varieties & types. The structure of sleeve applicator and conveyor are made of SS 304 and the structure of tunnel is made from MS with powder coating. The SS 304 slat conveyor for proper product conveying. (For the processes of sleeve inserting and sleeve shrinking. Worm for the positive feeding.DescriptionShell : Consisting of ‘U’ trough of suitable dimensions. Construction of S.S. and side plates duly M.S. stiffened from outside and from inside with S.S. Mixing Mechanism : Paddle type blades welded to the main shaft provide for efficient mixing of thick heavy material. PTFE gland mechanism provided at shaft ends prevents ingress of external powder into the trough and prevents leakage. 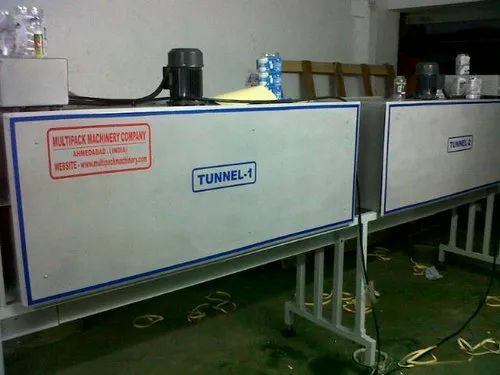 Charging :From the top charging can be done through a hinge able lid, hopper or Nozzle can be provided for additional spraying of additives.Discharge : By bottom discharge slide Iris or Butterfly valve of suitable diameter, for regulated discharge. Drive : Consisting of suitable H.P. TEFC 3 phase ac 415v / 50 cycles motor coupled to suitable worm gear, with driving shafts mounted on suitable plummer block.Mounting : Mounted on suitable ISMC Section Stand, with protective covers for belts and couplings. Moc : All contact parts in S.S. Constructions. Complete unit with S.S. cover and all surfaces polished to mirror dull finish. MS parts dull painted to smooth finish. 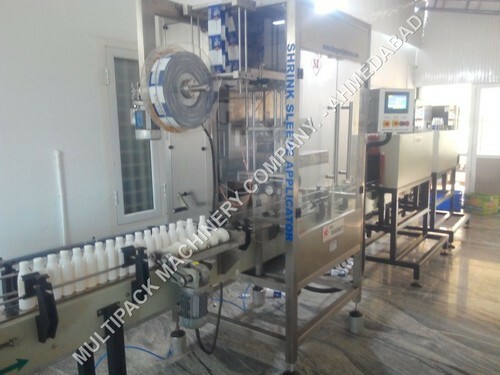 Bottles are Automatically fed (or inline with other units) on the running conveyor of the applicator. Roll type sleeve should be loaded on the unwind station. 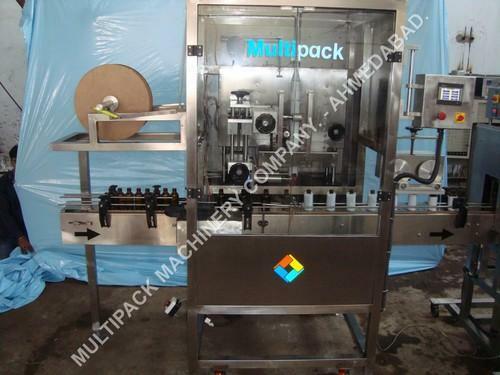 Bhagwati Shrink-Sleeve Labelling Machine high speed uses newest shrink technology with MMI and PLC base control panel. The bary centre and base have been accurately design, even use this machine with high speed for long time machine running still very stable and smoothly. 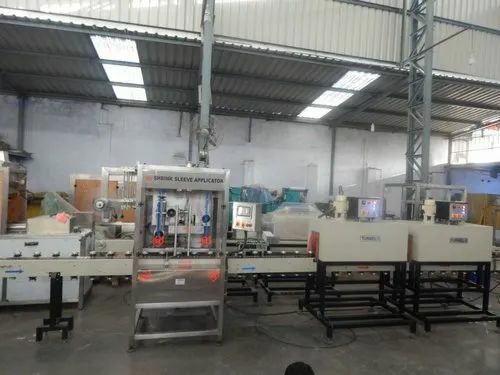 Many model with all kind of speed selection from 50/minute to 200/minute and is suitable for wide range; it can be modified according to package’s shape. Can meet, all kind of required no matter it is for cap or bottle. 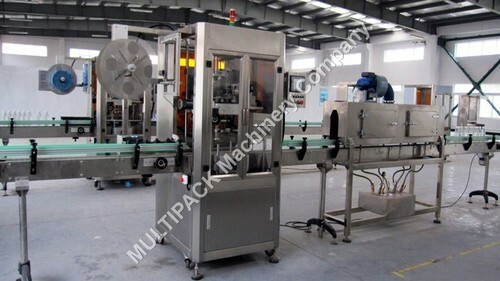 The machine is suitable for Pharmaceutical, food industries; it can be for health-food, medicines, Juices, Milk, Drinks, etc. This equipment is exclusively designed for labeling containers like bottles and it can label 150 bottles in a single minute. 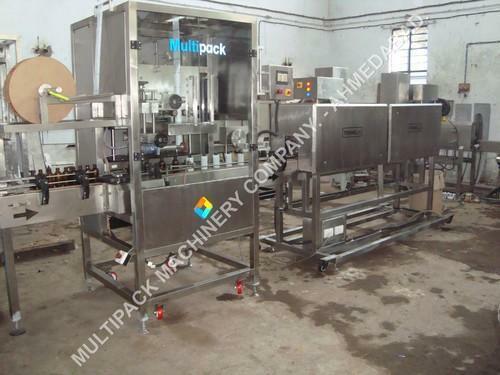 It is designed with single contraction label feeding tray and automatic detection and positioning system which are then controlled automatically by micro-computer. Its works out effectively as the labeling operation really takes place in a swift and automatic manner that saves labor cost as well. The use of hazardous and toxic drugs is becoming more and more common place and so are the risks associated with processing, handling and administering these drugs. Health and safety risks need to be looked at from a wider viewpoint as not only are there risks to the patient during the administration of the drug, there are also risks to clinical assistant, filling machine operators, onsite pharmacists and logistics personnel all through the product lifecycle. Vial Shrink Sleeve labeling is specially designed for Pharmaceutical Injection vial full body sleeving as well teck temper evident sleeve labeling systems for best security protect sterile valued dose, The unit cycle is controlled by PLC, with touch panel HMI to allow operators to easily enter the operational parameters of the machine. It is equipped with a knife and a large unwind unit for sleeve rolls up to 300 mm in diameter and from 20 up to 125 mm lay flat (suitable for caps of 20 to 70 mm of diameter). As an option, it can be fitted with a longitudinal perforation device, making it easier for the consumer to tear off the sleeve. The production speed up to 80 p/min compliments our Multipack linear labelling systems perfectly, especially in the context of the machines extremely economical price as compared with more high speed machines. 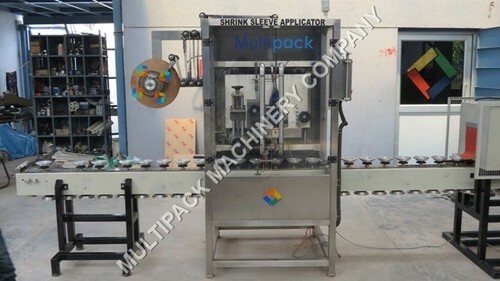 For products with certain characteristics (relative short products and low production speeds), Multipack T can also be configured for the application of full-body sleeves providing an extremely low cost sleeving solution. Such a configuration includes an optional transverse sleeve perforate facilitating the detachment of the upper tamper sleeve from the lower decorative one. 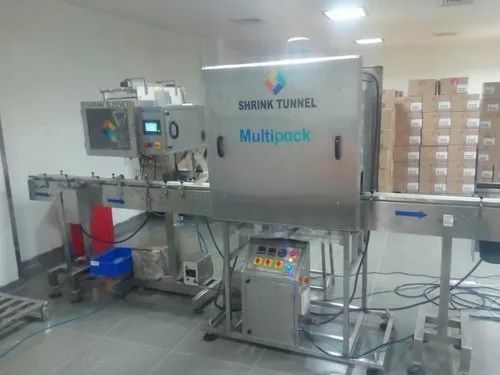 Multipack can be easily integrated into an existing production lines or supplied as a complete line solution, with hot air shrink tunnels and product feed and spacing units to provide the possibility of a complete turnkey line solution. change over each sizes product than change parts shall be required for sleeve inserting unit , feeding products , and hot air shrink units. The Protective Vial Sleeve assists in decreasing this risk of contamination and spillage of drugs associated with breakages. The unique system works with vials of all dimensions and is shrink fitted to the contours of the vial and overseal, with a rigid plastic base to help cushion any impact from the vial being dropped. The shrink sleeve, which is made from PVC or PET, encapsulates the vial and its contents in the event of a breakage, therefore minimising any spillage and contamination of the surroundings. With specialist knowledge in the protection of container vials and injectable pharmaceutical manufacturing processes, we can assist in the problem-free implementation of the technology into your production process, be it small scale or commercial production. A dedicated team is also on hand to support the installation as well as the validation of the equipment. Once heat shrunk to the vial, the protective vial sleeves are designed to trap toxic substances within the unit if the vial is compromised through a breakage or surface damage, reducing possible contamination of production equipment and minimising the possibility of product contact for the end user. The protective vial sleeves are available in transparent PVC or PET with a rigid base cap or flexible bottom label. They are suitable for manual and semi-automatic application, or fully-automatic lines and are heat shrunk around the contours of the vial and aluminium crimp seal to ensure a tight fit. Fully Automatic operation and control. Can handle GLASS / HDPE / PP / PET / METAL TINS in all shapes and sizes. Rotary Cutter – ensure accurate sleeve cutting and speed. Heave Machine Structure ensure vibration free operation under High Speed. Machine will have manual up & down arrangement for sleeve length setting. 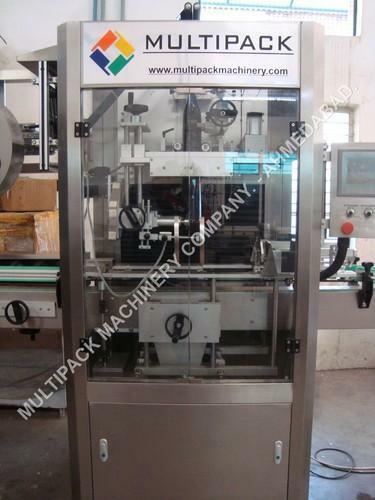 Looking for “Shrink Sleeve Applicator Machine”?